I didn’t practise what I thought praying meant, not in the way I recognized other people using it for the reasons they did. I suppose I have always had a deep sense of my own spiritual beliefs ever since I was a kid. This is what was conflicting to me, all I had to do was pray and all would be well? What my parents did teach me, mostly my father, was that if you worked hard and honestly you would be worthy of a good life, this made more sense to me growing up. There have been times in my life that have been difficult, just like you, we all have struggles and challenges to face, I think it might be safe to say ‘that’s life’, that is how it is sometimes, we have to take the good with the not so good. It has been during those difficult times though, that people have intentionally prayed for me, I know this because they have told me they have. I must admit there was a degree of comfort in knowing that they were at the time of my distress, not because of who they might have been praying to and that I might benefit from this entity, but because that person cared enough about me to gift me a moment of time out of their life to think of me. Even though I may not use the word prayer itself, it doesn’t mean that I don’t send my devotion out to whomever has requested a prayer or two from me, of course I do. But I like to think that consciously my energy and the light in me, is a part of our world, and it is something I give freely all the time. The most important thing right now, is understanding how much we all need to participate in raising human consciousness now more than ever before, for this planet. 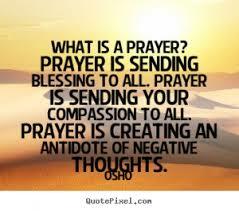 Send your healing energy to the collective each and everyday, consciously or with a prayer, because it will be in the love that you send with your thoughts or out loud, that will help to change this planet.